Publisher: Magna Publishing Co. Ltd. This item in General Reading Books category was first added to our catalog on 01-14-2014. 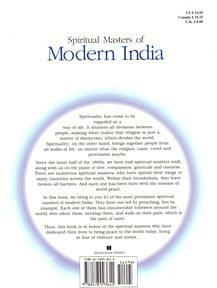 Buy Spiritual Masters Of Modern India, sold & shipped by Paul Mann Inc where you can shop online for Indian Books & Magazine Subscription for Stardust, Savvy, Filmfare. This General Reading collection has been tagged as indian history, hindu religion, spirituality book .